FREE book delivered directly to your Inbox. 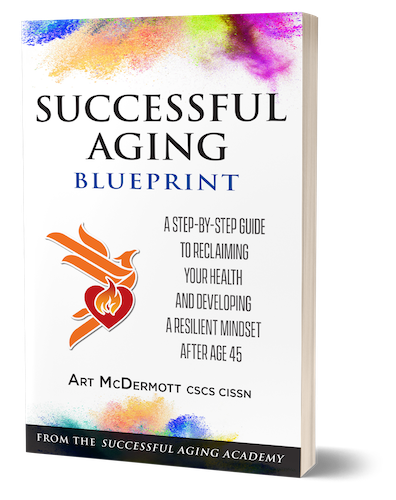 “A fantastic read for anyone wanting to live their 50s, 60s and beyond the fullest! It all starts with weight loss. Once the weight comes off, sleep improves, attitude and confidence skyrocket, and activity levels are back to where they were meant to be! In my new book, I walk you through the do’s and don’ts of weight loss over age 45. By acting now, we can completely alter the trajectory of your health and longevity! And, together, we will define exactly how to do it. Weight loss over age 45 is NOT the same as when we were all in our 20’s. Your metabolism has slowed to a crawl! Discover how to reignite your metabolism, lose the body fat and finally get the body you’ve been searching for! You can OWN the coming decades…and do so on YOUR terms. I am deeply motivated to get this information into your hands. That’s why the book is FREE!